Here is a report I received from Rabbi Leibel Fine on some Purim celebrations in town. I first met Leibel when he wa s just a little boy; his father Rabbi Ronnie Fine and mother Simcha would invite my friends and I to their home and the Chabad Lubavitch Organization headquarters on different occasions. South Shore in advance of the community's Purim Celebration on Sunday,Feb. 24. Chabad officials attribute record participation in dozens of events sponsored by its centres in Montreal to one-on-one outreach of its affiliates. Renzo Paredes was driving with a friend this past Sunday afternoon, on the Jewish holiday of Purim, when a group of bearded young men dressed as clowns knocked on his window. 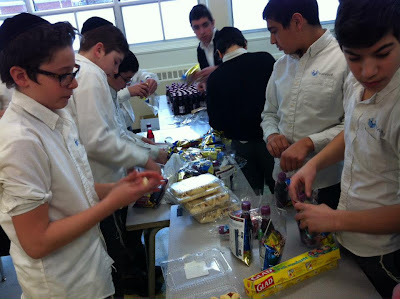 Boisterously wishing him a “happy Purim,” they handed him a traditional Purim food package, known as mishloach manot, containing a bottle of grape-juice, some Purim pastries called hamantashen, and a note from the Chabad-affiliated Montreal Torah Center. “I was very surprised to see something like that. It felt good. 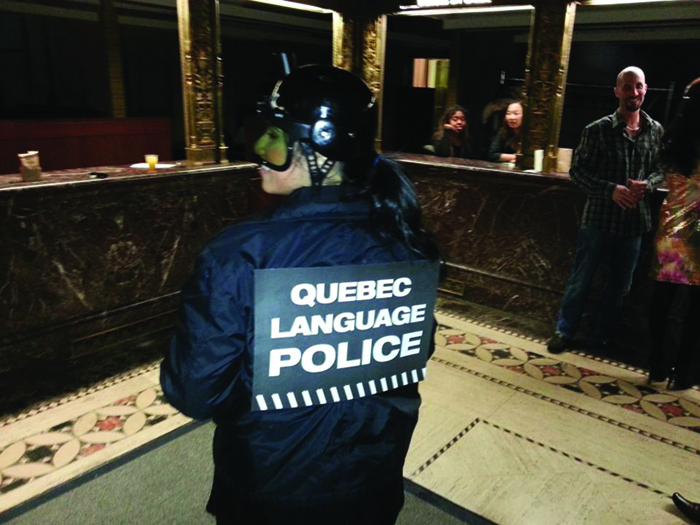 It felt very good to know that they want to share Purim with everybody,” said Paredes, a resident of Cote des Neiges. Paredes’ experience is no exception. Chay Elfassy, who helped promote and plan their Purim Celebration for350 young people in Old Montreal. Rabbi Shmuli Weiss of Chabad at McGill says that a similar mix of social media and word of mouth brought over 600 people through the doors of the iconic Chabad House on Peel Street. Members of the Chabad student board called their friends and made sure that they knew that they were invited guests at Chabad’s Purim Around the World celebration, and those friends brought even more friends. Perhaps the strength of one-on-one interaction was most evident in Lasalle, where Rabbi and Mrs. Chaim and Chanie Brand had just founded their Chabad centre last December. 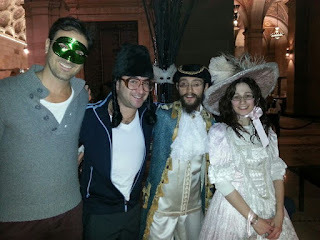 Held in a rented hall, their Purim celebration was their first event, and they spared no effort to ensure that everyone would feel welcomed. The Brands went door-to-door with mishloach manot gifts to personally invite everyone they knew to their celebration. With over 80 attendees, Chaim Brand was quite satisfied with the turnout. 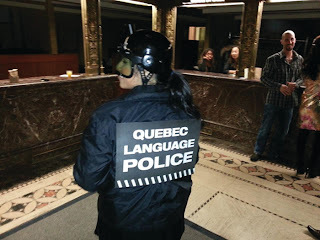 At a young adult Purim party in Old Montreal last week, bilingual Côte Saint-Luc resident, Leslie Perez, sparked some humor as she disguised herself in an overzealous S.W.A.T. Quebec Language Police Purim costume. 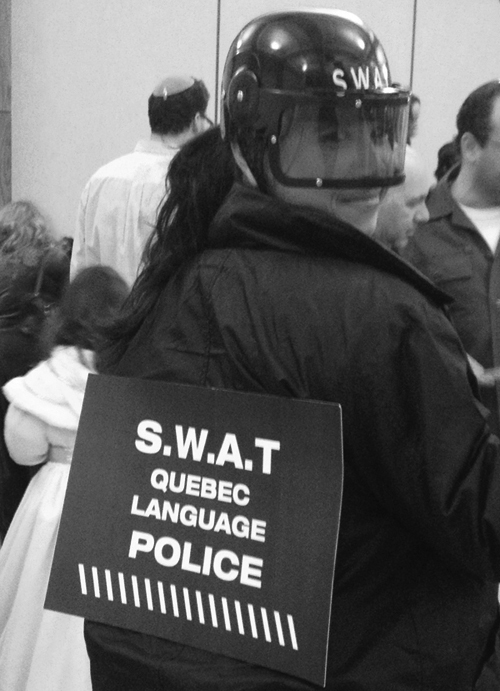 “It is ridiculous to see how our provincial government is prioritizing invasive language ethics especially considering there are more urgent matters to be tackled in our province,” comments Perez of last week’s OQLF (Officequébécois de la langue française) reactions over the use of the word "pasta" in a menu. Leslie Perez in action. Take that Pauline!! An Insider's Briefing with the man behind "the MK"
A few weeks ago I got a call from Larry Rosenthal, a community activist for the Jewish Community Council of Montreal, B’nai BrithCanada, The Young Israel of Chomedey Congregation and The Montreal Torah Centre. I had interviewed Rabbi Emanuel on a number of occasions, but never sat down with him before. Larry was anxious to give the JCC, a.k.a. the Vaad Ha’ir, some exposure. I suggested to Larry that he try to organize an Insider’s Briefing with Rabbi Emanuel and some of the local Jewish media. The idea was sold and on February 19 a number of us gathered quite appropriately at one of the city’s most popular kosher restaurants, Ernie and Ellie at Decarie Square where owners Roman Kreyzerman and Rabbi Israel Sirota not only sat with us, but took part in the dialogue. Roman Kreyzerman, Rabbi SaulEmanuel, Rabbi Sirota and Larry Rosenthal. Rabbi Emanuel, a charismatic native of South Africa, has headed the JCC/Vaad Ha’ir of Montreal for 14 years. He told us how companies from across the country continue to source out MK Kosher certification. “We make running a kosher business easy, keeping all kosher data on a private database called Digital Kosher,” he explains. “This is an automated system for managing ingredients lists, updating to the latest kosher certificates, and ensuring that certified kosher products contain only kosher ingredients. Kreyzerman agreed that it is not the Vaad which sets the prices. “It’s our suppliers,” he said. Rosenthal shared a story about how dedicated an individual Rabbi Emanuel is. Having become aware of an elderly woman who could not access any kosher food at the Hôpital du Sacré-Cœur de Montréal in Cartierville, Rosenthal called Rabbi Emanuel. After having no luck with the dieticians, the rabbi reached the hospital ombudsman who promised to get back to him with an answer …in 45 days. “Ombudsman,”the rabbi responded, “she might not be alive in 45 days.” Taking the matter into his own hands, the rabbi accessed a dietician he knew at St. Mary’s Hospital who was able to help resolve the situation. “What percentage of the Montreal Jewish community keeps kosher?” he was asked. While the rabbi said he could not give precise figures, noting he would love to see a formal study done on the topic, he estimated that as much as 25 percent are kosher in the strictest sense. The JCC has been in the business of kosher certification since 1922. For more information about the Vaad, log on to www.mk.ca.